This month, we concentrate on two new cruise ships, one, Crystal Debussy, built for the rivers of Europe, and the other the flagship of TUI’s Marella UK ocean-going brand. The rebranding of TUI (formerly Thomson) came into sharp focus in mid-May with a glittering evening in the port of Palma (Majorca) and the naming of Marella Explorer with an impressive on-board party. Star of the night was DJ/singer Craig David, the guests’ wristbands activated during his performance, changing colour to the beat of the music while floating pool lights and lasers heightened the futuristic display. A spectacular release of fireworks lit up the sky to close the show as he finished his set. Most of TUI’s 600 UK travel shops were represented, plus TUI partners and production team, and the media. A fantastic evening, with few aware that by the morning the ship had docked at Barcelona. Explorer, the latest and largest ship in the six-strong TUI UK fleet, comes in at 76,998 tons, accommodates 1,924 passengers looked after by 860 crew, giving a highly-commendable passenger/staff ratio of 2.3. Douglas Ward is going to need to re-evaluate the TUI grading with a ship highlighted by the first ever Champneys Spa at sea, nicely very up-market. Explorer 2 follows next year, adult only, when TUI will go over to an “All Inclusive” product including selected draught and bottled beers, spirits, aperitifs and soft drinks. Transfers and service charges are already included. Marella is certainly going up-market with the multi-million refurbishment of a 4-star ship which started life as Celebrity Galaxy, became Main Schiff (a TUI brand) and has retained the best of both, including the cinema. 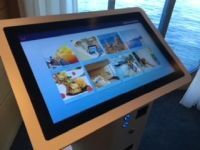 Introduced is Indigo – the ship’s new flagship bar, club and casino, and the aforementioned Champneys. In just four weeks, around 1,600 people, from partners, contractors and the Marella Cruises team, provided more than 200,000 man hours to deliver a dramatic multimillion pound makeover at Cadiz. A total of 45sq km of carpet was laid, along with more than 60km of data cabling and 650 wi-fi access points. Marella-branded items weighing 10 tonnes, including uniform, and 1,000 show team costumes were purchased. We are not sure how many litres of paint was needed to introduce the cruise lines’ signature wave hull design but the result is awe inspiring. Explorer feels like a brand new ship. 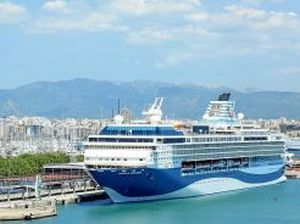 Marella Explorer boasts 962 cabins, nearly 40% with balconies, and spans 13 decks. The decor is standard throughout with stateroom sizes ranging from 16sq m with large picture windows (and the same size for the inside version, ideal for solo holiday makers), a balcony offering but with essentially the same bedroom square footage, and a selection of Premier suites, the largest 49sq m. Even the smallest cabin has plenty of storage space and a full-size shower unit. 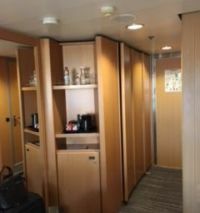 Every stateroom has tea and coffee making facilities, very British. The ship, however, shows its international heritage with European and American electrical plugs. The on-board shops will sell you an adaptor, but you might find it cheaper going into Poundland before you embark. There are 10 onboard restaurants and 10 bars. TUI is following the industry trend with exclusive cover charge dining for that special night out, including the Surf and Turf Steakhouse, Kora La Asian eating, and the Dining Room, a ‘dress to impress’ French-style eatery, also open for a quieter breakfast. The main waiter-service restaurant is called Latitude 53, is spread over two decks and is bright and spacious with an offspring called Vista for contemporary Italian offerings. 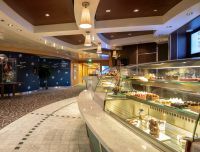 Called The Market Place, the ship’s buffet-style dining is up on deck 12 with not only a traditional layout but in the stern a large bar area with a sliding roof. There is an Italian section called Mediterranean, where guests can choose pizza toppings, mix-and-match pasta and load up on greens at a salad bar. There is also a tapas area specialising in Spanish favourites and small dishes. The main show lounge has 800 very comfortable seats, all the latest technical gizmos and no restricted sight lines. Entertainment is provided by the tedGroup, with a bill that includes 12 individual stage shows ranging from the music of David Bowie to Latin American. Sadly, in a visit of less than 24hr to view a whole ship and take in a party that went on to the early hours, a show could not be fitted in. At least the massive outdoor screen provided a wonderful backdrop to the festivities. No time to check-out the children’s facilities. The gym looked very complete and, tempting as it was, Champneys and the spa will have to wait for another time. Crystal Cruises is one of the world’s great cruise lines, introducing the expression ‘6-star ship’. Launched in 1990, it reached a new high for high-class innovative cruising for a discerning clientele, winning prize after prize. Carrying just 1,000 passengers each, Crystal Symphony and Crystal Serenity have set the standards other operators try to emulate. Owned by Genting Hong Kong since 2015, Crystal now includes Crystal River Cruises, Crystal Yacht Expedition Cruises, Crystal Luxury Air and Crystal AirCruises. 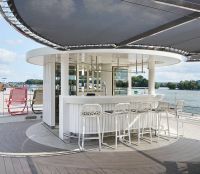 Launched in 2016, Crystal River Cruises set out to introduce its sea-going patrons to the delights of the European rivers, a completely different experience from anything they were used to, a luxury concept that the company was well organised to provide. The first ship, Crystal Mozart, is distinctive, twice as wide as any other river-going craft, with 91 crew looking after just 154 passengers a ratio of 1 to 1.6. The problem with its size is it can only navigate the Danube River between Passau (Germany), and Budapest (Hungary) with its wider locks. By all accounts, it is a stupendous vessel. The next move by Crystal was to introduce four ships navigable on most European waterways, Bach and Mahler in 2017, and Debussy, which was named by Broadway star Rachel York in Amsterdam last Monday (28 May), with Ravel following shortly. Where Crystal is completely different from all other river-ship operators is that the vessels are built in its own shipyard at Wertften on the Baltic and the 106 guests are accommodated on two decks only, with no cabins beneath the waterline. The ships are the maximum 135m by 11.5m allowed by the locks. Some other operators cram up to 180 passengers into the same space. Butlers are provided, there is 24hr room service and an open concept when it comes to dining. Crystals’ seaborne cuisine is acclaimed and even with the tiny galley, the Michelin-style dining is retained, with the kitchen staff often the first off at a mooring point and quickly down to the local market to search for the fresh produce needed for the regionally-inspired menus. As with all river-cruise ships, access is very simple. No massive terminal, and gangways just a step from the quayside. With Debussy, suddenly you are in a different world, rather like entering a very modern and chic high-end restaurant with elegant light fixtures and sunlight everywhere. The ship’s Palm Court lounge has a glass ceiling allowing natural light in. Crystal Debussy was christened in Amsterdam, not at the usual river ship mooring spot but alongside the main deep-sea cruise terminal, a very fitting setting. Marking the occasion were Crystal president and CEO Tom Wolber, Crystal River Cruises’ vice president and managing director Walter Littlejohn, and Rachel York. The ceremony took place during the ship’s three-day stay in Amsterdam on its ten-day ‘Splendours of the Rhine’ voyage, allowing guests aboard the sailing to participate in the traditional festivities, while Crystal crew members looked on from the decks of the ship. Godmother Rachel York serenaded guests with her rendition of “Defying Gravity”, a nod to her esteemed career on the stages of the world, including those aboard Crystal’s ships as part of the Crystal on Broadway programme. 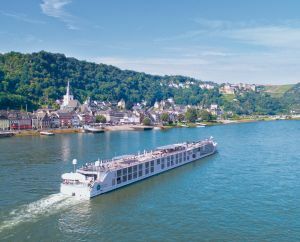 Throughout 2018 and 2019, the ship sails routes of seven and ten days between Amsterdam and Basel along the Rhine and Moselle rivers, visiting Switzerland, Germany, Netherlands and Belgium.